A time of great transition. In the sea ammonoids and fish evolve and quickly diversify. On land trees and forests appear for the first time. The first insects, spiders, and tetrapods evolve. To the left a cluster of crinoids wave in the shallow water currents. Nearby are assorted corals and brachiopods. Several types of armoured fish (ostracoderms and Placoderms) swim, or rest on the sandy bottom. To the right are two eurypterids "sea scorpions"), with an acanthodian fish just above. On land the first primitive plants move ashore. In the southern hemisphere the great supercontinent of Gondwanaland (including what is now southern Europe) moves steadily north. But most of the action is happening in the north, where the two continents of Laurentia and Baltica collide, closing Iapetus Ocean and forming a mountain range where sea once was. This is known as the Caledonian Orogeny. At the same time other mountain ranges are thrown up - in southern Laurentia the Acadian/Appalachian, to the west the Antler /Cordillerian, to the north the Ellesmere (along the north margin of Laurentia) and to the far east the Uralian (in eastern Baltica). The new continent that results from this collision is called Laurussia or Euramerica. During the Devonian the equatorial region was dominated by this newly formed supercontinent, sometimes called the "Old Red continent". It is so called because of its prevailingly reddish, erosion-produced sediments that were deposited in England, Scotland, the Ardennes, and the Rhenish Mountains. The great shallow sandy bays, deltas, and inlets of the Old Red Continent provided a prosperous home for strange armoured jawless fishes, as well as the placoderms which had appeared at this time. To the north again lies the Siberian terraine. The whole of Euramerica starts to drift northward, whereas Gondwanaland underwent a counterclockwise rotation around the Australian axis. Some of the Chinese blocks and Armorica have started to rift away from the Gondwanan margin. Siberia and the Kazakhstan terranes continued to drift northward. Both Gondwana and Euramerica are surrounded by subduction zones. They are set on a collision course that will culminate in the formation of a single supercontinent of Pangea during the Permo-Carboniferous. Coccosteus (in Italian). For a discussion of Devonian paleogeography which ought to be on Palaeos, but isn't, see Paleogeografica e Orogenesi from the same site. If the Devonian was the Age of Fishes. Devonian climatology is the Age of Baloney. Reported results vary strongly depending on what climate proxies are used and where they are studied. Historically, the Devonian has been regarded as largely warm and equable, with a disastrous drop in temperatures in the Late Devonian leading to the Frasnian-Famennian "mass extinction(s)." The reason for this impression may be that most work was traditionally done on the "Old Red Continent," i.e., the shallow marine sediments of the seas around Euramerica. A careful examination of the paleoclimate maps at the Paleomap Project site suggests a different global picture. See climate maps of the Early Devonian, Middle Devonian, and Late Devonian. The climate of the Early Devonian is rather strongly zonal, with a narrow equatorial tropical belt, broad subtropical arid zones extending to about 35° latitude, and a temperate zones extending essentially to the poles. There is little change in this general picture at any time in the Devonian. In the Late Devonian, the southern "cool temperate" zone expands, with indications of glacial ice in parts of far western Gondwana (northern South America). However, the northern temperate zone appears to retreat before a subtropical zone which extends almost to 60° N. So, although parts of the south were cooler, parts of the north, which had very little land area, were becoming warmer. In short, we are not looking at a simple pattern of planetary cooling. Instead, we would suggest that the observed effects can be accounted for by a modest drop in sea level combined with a series of local changes related to the formation of the Pangean supercontinent and the spread of land plants. To appreciate the problems, we need to briefly review the tectonics of the period. As we approach the Late Devonian, Pangea is beginning to take shape. This involved pressure on the Laurentian continent from three sides, as well as gradual closure of the seaway between the Rheic and Paleotethys Oceans. As the pressure on the Laurentian plate increased, huge mountain ranges were thrust up around the periphery of the continent. At about this same time, plants were also beginning to make an impact on the land surface and on atmospheric chemistry. Carbon dioxide levels were still several times higher than in present times, but may have dropped as much as 80% from the Silurian. 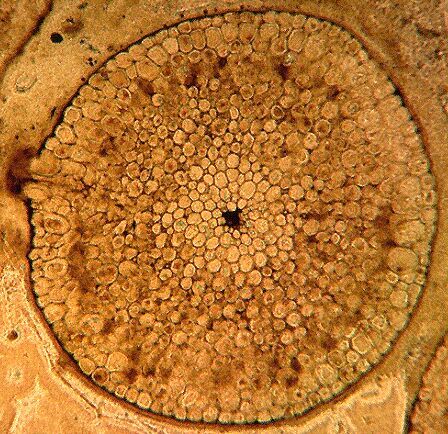 In addition, the Late Devonian saw the evolution of large trees with deep root systems. These strongly increased terrestrial weathering, with a corresponding draw-down of carbon dioxide. With these generalities in mind, it is easier to appreciate what was happening on a local level. For most of the Devonian, South America had been invaded by a very shallow sea. Further, the broad connection between the largely equatorial Paleotethys and the deep southern Rheic Oceans probably moderated climates all along the northern coast of Gondwana. In the Late Devonian, that connection remained open, but it was constricted, and deep ocean circulation was probably cut off entirely. The Rheic became colder and more thermally isolated. The flow of warm water from the Paleotethys decreased along the north coast, and the falling sea levels drained the central shallow sea. In addition, as South America began to move north, it emerged from the south polar zone of air circulation into a zone dominated by the trade winds passing east to west. Instead of receiving relatively warm, moist air from the Rheic which might create seasonal rains, northern South America would be exposed to cold air dehydrated by the long passage across the entire Gondwanan continent. Thus, it is not surprising that we observe periods of glaciation at high altitudes in northern South America. Laurentia was also in the southern trade winds. These winds would carry moisture from the Paleotethys. However the mass of the continent lay in the rain shadow of the mountains raised by the subduction of the Gondwanan and Baltican plates, as well as numerous microplates around the eastern and southern margins. The internal geography of the continent was dominated by desert, with an accumulation of evaporites which, when used as climate proxies, may well suggest a hotter climate than was actually present. Along the well-studied coasts of Baltica and Laurentia, marine chemistry would have undergone enormous changes. The rain which was not falling on central Laurentia and South America was falling on the eastern and southern slopes of the ring of mountains around Laurentia. Forests were beginning to grow here, with deep-rooted trees stirring up soil ions which would be swept into the narrow oceans with torrential flows of fresh water. While the precise results of this process are impossible to reconstruct, it almost certainly meant great changes in ocean chemistry and plankton populations, as well as the usual result of excess runoff -- algal blooms. While it seems unlikely that this extended exercise in geochemical speculation hits very much closer to the truth than anything else, it may serve as a reminder that local conditions often matter a great deal more than global generalities. ATW050108. Public domain. No rights reserved. The most famous of the Devonian Lagerstätten is the Rhynie Chert from Scotland. This deposit is dated as from the Pragian Age of the early Devonian. Paleogeographic reconstructions and other evidence suggest the environment was tropical to subtropical. This deposit is a petrified peat bog preserving the plants in exquisite anatomical detail in the place where they grew and died. Fossils from the Rynie Chert were buried in short-lived freshwater deposits that later were subjected to replacement of organic material with silica, forming a chert deposit that preserved even details of the cells of the organisms. The peat species include Aglaophyton (formerly Rhynia major), Horneophyton, Nothia and the lycopsid Asteroxylon, but the only plant preserved exactly in its growth position is Rhynia gwynne-vaughanii. The preservation of all these plants is so fine that individual cells can be seen. The detail of preservation shows, for example, that the stomata of Rhynia were connected to an extensive intercellular system of air spaces, essential for the ventilation of a land plant, and that groundwater was absorbed through unicellular hairs on the horizontal stems. The plant assemblage itself is interesting for the Early Devonian in that its members are not recognized or recorded elsewhere in Euramerica. It is impossible to determine how typical the Rhynie Chert flora was of the wetter areas of Euramerica. Other Early Devonian assemblages contain plants with far greater amounts of thick-walled structural tissues, and are thus thought to have lived in places subjected to much drier periods. As well as a number of types of land-plants, Fungi, including mycorhizal fungi, have been recovered from the Rhynie Chert. Wefts of fine, sparingly septate hyphae, some terminating in vesicles, which occur within degraded tissue of vascular plants, are usually identified as a saprotrophic fungus Phycomycetes), but thick-walled spore-like bodies superficially similar to those of endomycorrhiza Endogone) suggest that the fungal hyphae lived in symbiotic association with the vascular plants even at that early stage of terrestrial evolution, just as they do today. Also found are algae, including mats of filamentous blue-green algae, a charophyte green alga called Palaconitella, and filamentous green algae. Small arthropods are exquisitely preserved between the plant stems and within sporangia. They include crustaceans, a springtail (Class Colembella), several small mites, the first spider and numerous larger extinct mite-like arachnids called trigonotarbids. The trigonotarbids probably preyed on other arthropods while the insects and mites ate spores, leaf-litter, and microorganisms or sucked plant sap, as the associated wounded plant stems suggest. page uploaded on Kheper Site on 28 May 1998, page uploaded on Palaeos Site 10 April 2002.